Believe it or not, I don’t have a large stash of fabric. My fabric gets used very quickly as I mostly buy what I intend to use. Having said that, sometimes I do have a few odd pieces left over and that’s when I will try to come up with something new. This is exactly what happened with my Sweet Hearts wall hanging. 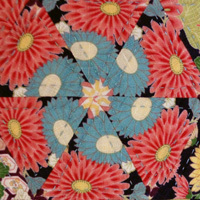 The last of the navy floral fabric was laying on my cutting table and I was thinking about what I could do with it. The gold, russet and green sprigs were the obvious choices to match. I started pulling out lots of autumn colours, but the magic just wasn’t happening. In desperation I pulled out my tub of larger leftover pieces and I threw the peachy-pink fabric onto the cutting table as I delved into the tub. It wasn’t until I turned around and saw the navy and peach fabrics sitting together like old friends that I got a shiver of excitement. It was a match made in heaven. Even now, I still don’t know why they worked so well – they just did. The design of the pattern came together when I decided to use all of the fabric. I wanted to have nothing left. I couldn’t decided which fabric should be the feature fabric, so I gave them equal positive/negative status. 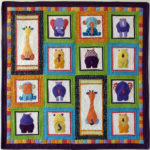 The six inch squares and simple appliqued hearts (using fusible webbing and then blanket stitched) are easy to make. The quilt is finished with a large quilt stitch making it perfect for a first quilt. 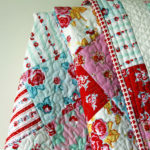 Traditionally, this is what patchwork was all about – using the scraps to create something new. No fabrics were ever wasted. These days, fabrics are freely available in store and online, and it can become all about the shopping. Many quilts are well planned with perfectly matched fabrics, but if we were to dig into our stashes, and use our scraps, magic can also happen.